Delhi is the world’s most polluted city. I think. London however has been shaping up nicely this January in its bid to reach toxic gold. Here’s my attempt to unpick the ridiculous suggestions mooted in a bid to help us all ‘beat London smog”. In case there is ANY doubt this is a parody. Words from Nicola Baird (see www.nicolabaird.com for more info about my books and blogs). These doors at Senate House are the very ones that inspired George Orwell’s famous Room 101 scene in Nineteen Eighty-Four. My room 101 doesn’t have rats. Why does the news so often seem like an April Food at the moment: shouldn’t Butter and Phoebe be warning us that buying this stuff would be £24 badly spent? I remember writing an exposé about the Solomon Islands trying to flog tropical rainforest oxygen back in the 1990s… Now I think the islanders had it right, Londoners are so daft they’d have sniffed up bottles of this and passed them round their Uber. PM10s are not going to be watered down by an imaginary body spray. Got to admire capitalism because everything is an opportunity. Those masks aren’t going to help London tackle air pollution are they? Yup – eating avocado (vitamin D) and almonds (vitamin E) gives your body all the nutrients you need to fight toxic air pollution. I’ve read this. It must be right. It also gives zero thought whatsoever to how those pops of goodness arrived here (air freighted) or what damage avocado and super-thirsty almond plantations are doing where they are grown. Written by me in 1998. That was the advice from at least one school nurse to asthma sufferers. It makes sense, because there are still a huge number of families who drive their kids to school, refusing to accept that their journey is not necessary. It’s still an aspirational desire to drive. When environmental health officials are tricked (surely?) into saying it’s dangerous for kids to use the school playground be wary of following their advice. Already most kids stay indoors far too much despite the indoor air pollutants from cooking, furniture, sprays and cleaning products create a toxic soup. They can’t be independent from a young age because of the dangers from cars knocking them over (not stranger danger). 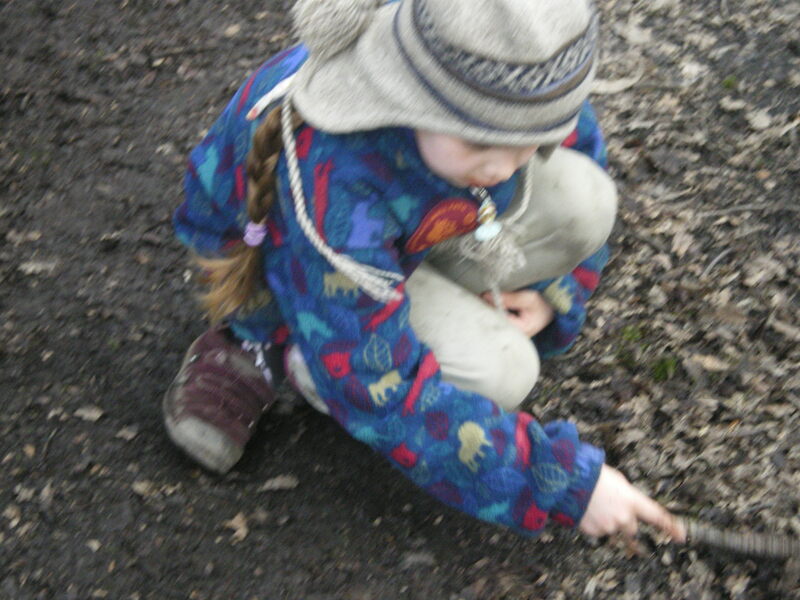 City kids need to know as much as possible about nature even if it is just jumping the weeds in the pavement cracks, pulling at last year’s hollyhocks languishing in the tree pits or hearing the blackbird singing on that house’s old TV aerial. Having a glimpse of even this diminished nature is what may help the kids figure out that life outdoors ought to be one of opportunity, not threat. My poor Victorian home is subsiding. The only way insurers deal with this is waging war on anything green around the foundations, and so the buddleia and jasmine have to go. It’s impossible for me to denude the bricks while my head is swirling with toxic London fog scenes and the sweet inner-city robin cheerily sings when it sees me heading towards its corner of the buddleia brandishing a bow saw. Watching The Crown on Netflix ought to cancel out visions of toxic smog… but no, in episode 4, in December 1952 there are a dreadful three days which flood hospitals and ultimately kill as many as 12,000 people during the Great Smog of London. Churchill is hopeless at coping with this, writing it off as British weather, an “act of God”. At least Sadiq Khan seems to be looking at our problem head on. Now he’s got to show the sort of leadership that no one has yet dared to do against the car lobby, and in particular diesel vehicles. Couldn’t we just do something radical like shake up the whole way Londoners move around for a trial phase and see if it made a difference? Of course I’m not training to run the marathon, but I’ve heard the moans. Toxic air wrecks “Marathontraining plans” so the runners have to head to the indoor gym and cycle on stationary bikes and indoor running tracks, rather than plod pavements. Wouldn’t it be great if the generation obsessed by bucket lists and meeting personal challenges could start working together to force politicians to make London’s air cleaner – and by default other cities cleaner as well? Because if they did within a year no one would ever have to cancel their training run. So where does that get us? Nine ways to clean up your act, or nine opportunities to speak up? The only good seems to be that at last air pollution in London – and the impact cars, traffic (and airports) have on it – is at last being talked about by everybody, even if the messages aren’t always clear. Next step is action. Please. Why’s there so much asthma? Nell sweeping the ground with a stick. For fun! More than 1.1 million kids have asthma in the UK. No one knows why it’s become a national epidemic… but air pollution doesn’t help. The links between fossil fuels and climate change are well known – burning carbon (eg, in gas for central heating or to heat water; or when you drive a car) adds carbon dioxide to the atmosphere. Driving adds other nasties too, including air pollutants such as nitrogen dioxide (NO2) and sooty particulates. London’s air pollution is hideous. Levels of nitrogen dioxide (NO2) on some of London’s busiest roads are currently over three times the legal limit. Given that, perhaps it is no surprise that the poorer you are in London the more likely you are to live by a massive road, and the more likely you are to die younger. In December 2012 London Assembly’s health and environment committee pointed out that the long-term health impact of exposure to toxic air pollutants lead to life-shortening lung and heart conditions. Right now there are more than 4,000 extra deaths each year in London from dirty air (particulates). This costs the economy a staggering £20 billion a year – twice the cost of obesity. Nell lives in Islington where about one in 15 deaths each year (7.9 per cent) are “attributable to long-term exposure to current levels of anthropogenic particulate air pollution”. Yuck. Don’t misunderstand: these statistics are not a reason for the lucky families who can buy or rent wherever they choose to escape to the country. They are a reason to ensure every child can breathe healthy air, wherever they live. Air’s kind of invisible so it looks clean. But blow your nose at Holloway tube by the A1 and inspect the grimy contents or try taking a walk in white coat and gloves (ha ha!) and you’ll see evidence of some gruesome grime. Or just go talk to an asthmatic – anyone with lung disease actually. When there’s a crisis families are too busy coping to be able to speak out. 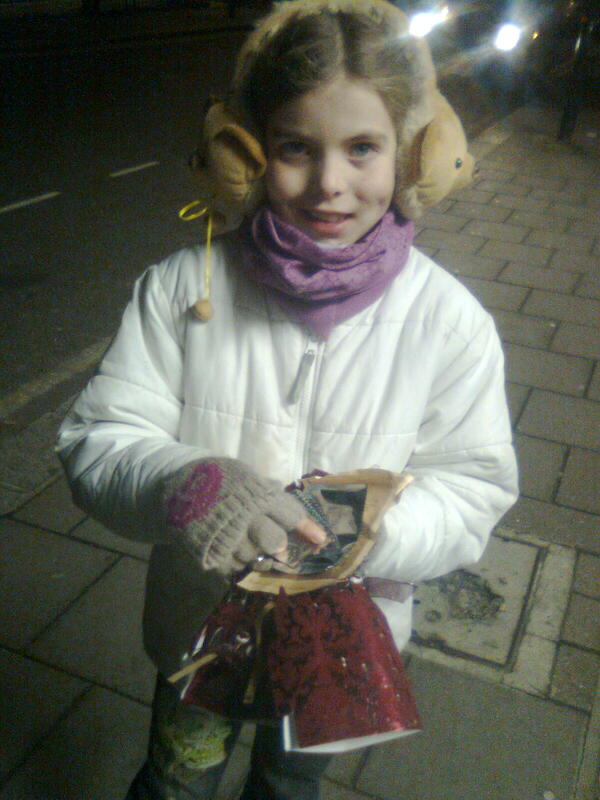 Nell and I worked on this blog post together when things are calm on the health front in a bid to get more families – from Mumsnet and other blog readers – to do something to tackle air pollution in 2013, the Year of Air. Here’s hoping you can help. Avoid using your car as a shopping trolley. You could use a buggy, cycle paniers, a granny trolley (rebranded in our home as a “warrior trolley” so Dad doesn’t mind taking a spin to the shops) or opt for a supermarket home delivery. Choose schools that are close to your home so the school run can be easily walked. Can you give up your car when it rains? This blog post is by Nicola Baird sharing ideas about thrifty, creative and eco-friendly ways to raise children. Reasons to splash in those puddles and get singing in the rain rather than take the car which can, for some, cause sudden death. For more info about parenting see my book Homemade Kids, or for my website click here. The reason I insist my children walk to school is all about pollution. Turns out that UK transport emissions cause 7,500 early deaths each year, see research here. I am horrified by this, but then thought well there are 60 million of us, so what does this figure really mean? But this fabulous mortality diagram from the Guardian is sure to get you thinking, see here. That figure of 7,500 early deaths is like everyone in a medium sized primary school (of 300 children) dying, plus all the students in another 24 schools. At what point did the UK get so big and uncaring that deaths equivalent to 25 primary schools stopped being newsworthy? There were 1,131 deaths from asthma in the UK in 2009 (12 were children aged 14 years or under). On average, 3 people per day die from asthma. To help make comparisons you need to know (all figures approx) that every day 1,700 people die in the UK . So each year that’s 643,000 deaths, making it easy to lose – or forget about – those 7,500 early deaths from air pollution. Is that why #doubledip and #recession are the words trending on twitter, not #airpollution or #airquality? It seems that we can chatter with no problems about being unable to afford petrol, car repairs or a holiday that starts at the airport. But in so doing ignore taking action – or sounding off about – on an issue we all could do something about. 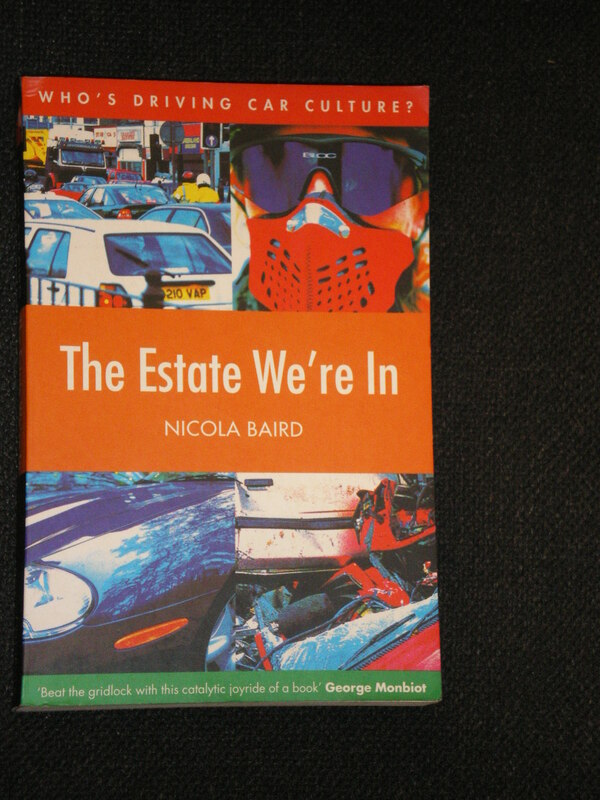 A week before Lola was born my book on cars The Estate We’re In: who’s driving car culture (Indigo) came out. I know you can’t criticise car drivers (I am one after all, and have even taught three or four people how to drive). But I wish you could get put on the naughty step for driving. If you’d like a FREE book: Bill Bryson’s Notes from a Small Island about travelling around the UK on public transport in the 1980s – a wittily written nostalgic journey which takes in bad food, timetables and clone towns by the very funny American then answer this question and send me your email. The book is provided FREE by the lovely folk from World Book Night. Q: Do you worry about air pollution or not? One out of 11 children have asthma. Here are two. This blog post is by Nicola Baird sharing ideas about thrifty, creative and eco-friendly ways to raise children. One out of 11 UK children have asthma. So what can a mum do to tackle air pollution indoors and out? Try this QUIZ and see how you do. For more info about parenting see my book Homemade Kids, or for my website click here. If you need a reminder of what asthma does to kids, and how air quality effects children’s health see this older blog post and 10-year-old Nell’s video here. 1 Indoor air pollution is increased by chemical fumes released from carpets, wallpaper, paint, fire-resistant materials and gas cookers. All build up in a well-insulated house. TIP: When you redecorate choose VOC-free (or low VOC) paints and glues which are easy to find in DIY stores (just look on the tin’s label). [ ] c You mean volatile organic compounds? They’re on the naughty step. 2 Avoid anything made from MDF. TIP: Don’t put MDF shelves (or any glue mix material including plywood) above a radiator. [ ] a Easier said than done. The kitchen’s MDF duh. [ ] b Didn’t I tell you that I rent and can’t organise a kitchen refit? [ ] c Does it tell me this at Ikea? 3 If you live and drive in a town or city use a petrol-fuelled car (or car club vehicle). TIP: Diesel isn’t as clean a fuel choice because the particulates released as you drive can trigger asthma attacks. [ ] a Look I’ve got a diesel car and I’m not changing it. For anyone. [ ] b I don’t remember this conversation at Car Supermarket. [ ] c OMG what do paticulates do? 4 Obviously don’t drive as much – because all traffic pollutes. TIP: Aim to walk your children to school as many days as you can. [ ] a You are one crazy lady. The roads aren’t safe enough for me to let my kids walk or cycle to school. [ ] b Not got the time, sorry. [ ] c Oh no, not blaming the school run again? [ ] a You really are one crazy lady. See above. [ ] b Don’t they teach this stuff at school? [ ] c Not a bad plan. 6 Have a boy. TIP: Girls are more likely than boys to develop asthma by the time they are 18. [ ] a Do you know how much IVF costs? [ ] b What would Caitlin Moran say if I told her this? [ ] c I’ve got daughters already, thank you very much. [ ] a How I long for the old days when mums just worried about OFSTED and SATs. [ ] b Great, just the excuse I need to move again. [ ] c How will I cope with a mardy teen miserable about getting asthma? 8 Everyone with asthma is at risk of a wheeze attack when there is a spike in air quality. TIP: This isn’t just a western world problem – New Delhi is notoriously polluted and 16 out of 20 of the world’s worst polluted cities are said to be in China. [ ] a This is just another reason to hate fog. [ ] b Get it. Will cancel the trip to the Great Wall of China. [ ] c I’m going to bookmark an air pollution app. Is there such a thing? [ ] a Why is purple the danger sign? Shouldn’t it be red? [ ] c I’ve looked at the map, and it’s pretty bad everywhere. 10 Playing sport in the afternoon isn’t always wise – it can be a wheezy time if there’s high air pollution. It’s also the time when ozone levels are highest (which reduce lung function). Add to that pollen and it’s a recipe for those with dodgy chests (eg, asthma sufferers) to start wheezing. TIP: Avoid strenuous activity then, and learn to keep your medication close. [ ] a Isn’t the Olympics held in the afternoon? [ ] b Just the excuse I needed to avoid it, thank you. [ ] c Is that why I keep hearing about sports people collapsing? [ ] a What a load of lefty bananas. [ ] b So tell me, are the London Youth Games at Crystal Palace in an area with poor air quality or good air quality? [ ] c I’m starting to feel extremely worried. 12. When you’re not in a car use quieter, less congested roads and paths – even if it means a bit of a detour. [ ] c Do it already. Yes! 13 Don’t do what London Mayor Boris Johnson has done on super-polluted Marylebone Road and spray glue around in the hope that air pollution will be stuck together then disappear. It doesn’t work. [ ] a Actually Spandex pants aren’t that great either. [ ] b That’s a joke isn’t it? [ ] c That’s it, I’m telling my councillors to do something in my local area. Mostly Bs – Perhaps you’ve got your head a little bit in the inhaler? Works better than sand though. Mostly Cs – well done, you could help tackle this. This blog post is by Nicola Baird sharing ideas about thrifty, creative and eco-friendly ways to raise children. Turns out that London’s air is far more polluted than I thought – and that triggers asthma. Nell,10, goes on screen in “Asthma is scary” to share with you what it feels like to struggle to breathe – and what she’d do if she was Prime Minister to sort it out for all of us. 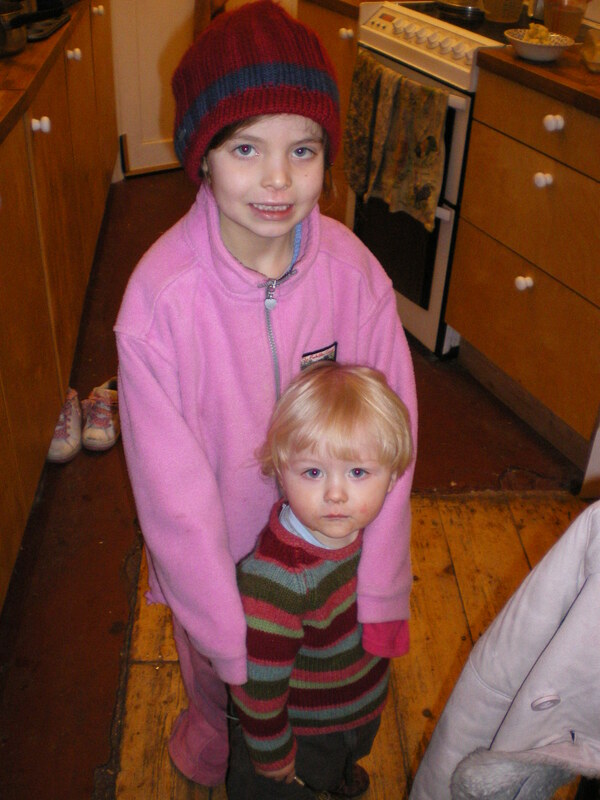 For more info about my book Homemade Kids, with lots of ideas about parenting, click here. Nell is well at the moment – thanks to the steroid medicine she takes morning and night. But after discovering how polluted the roads are where we live (ie, London), she gave me some quotes about what it feels like, and made a short video (above). I need to check the figures, but at a meeting in Islington this week it was revealed that our Mayor’s inability to sort out London’s air pollution is going to leave the capital with a fine from the EU of something like £300 million! That’s a crazy sum that could be used to improve public transport, or put towards placing cleaner filters on the diesel engines so beloved – and so polluting – used by London’s buses and black cabs. What ideas do you have for Transport for London or Boris to clean up our filthy air? Green Assembly Member Jenny Jones claims Boris has chosen to use a special glue (dust suppressants) in a bid to make the high pollution levels drop at two key monitoring sites on Marylebone Road and London Bridge. It’s laughable: and hardly sorting out the real problem? More info about it from this site too. 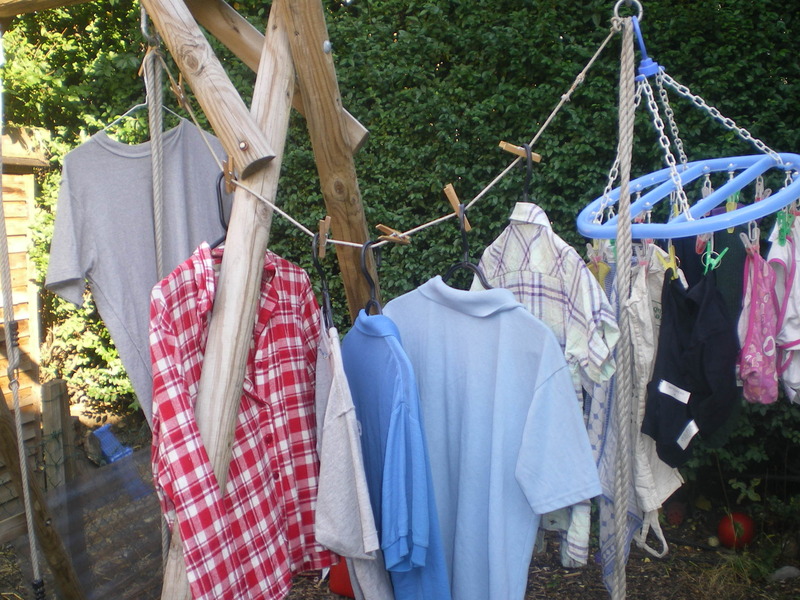 Using hangers to dry in a small space (off the swing) and then move straight to the wardrobe saves time. Like buses, good ideas always seem to come in quick succession. I’ve been trying to find ways to keep my electricity costs down (do this and you can pretty much bet it’s also good for the environment) and save me time. Reading the amazing American environmentalist, Sandra Steingraber’s new book, Raising Elijah (more on this in another post), she suggests that using clothes hangers to dry clothes outdoors, or in, saves time. Well it means you sort the clothes as you pull them out of the washing machine so that they are dried ready to go straight into a wardrobe. This is genius. Sandra also points out that it means your family’s clothes also last longer (no spoiling by the tumble dryer) and causes you less stress (because you don’t have to struggle to match stray socks, tangled jumpers or even need to iron shirts and blouses). Hanging up the washing is hard for small people, so they can't help as well as I'd like. I was just thinking about doing this when I had a house guest, Chris, to stay from Australia who has two children (now almost grown up). He saw my crowded drying line and noticed my “Is it going to rain?” panics. So as a leaving gift he presented me with 20 plastic hangers that can do the drying/hanging job. He also taught me the three-shake rule – to shake out the creases before you hang the garment up – and a clever technique with clothes pegs to stop the hangers being blown off the line. 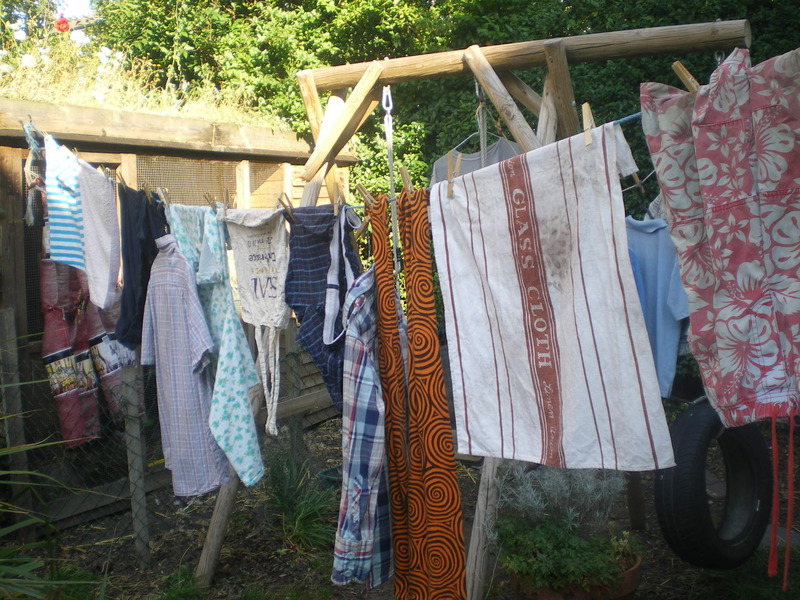 Actually I can hang clothes up fine on a washing line, but my children and partner find it hard. 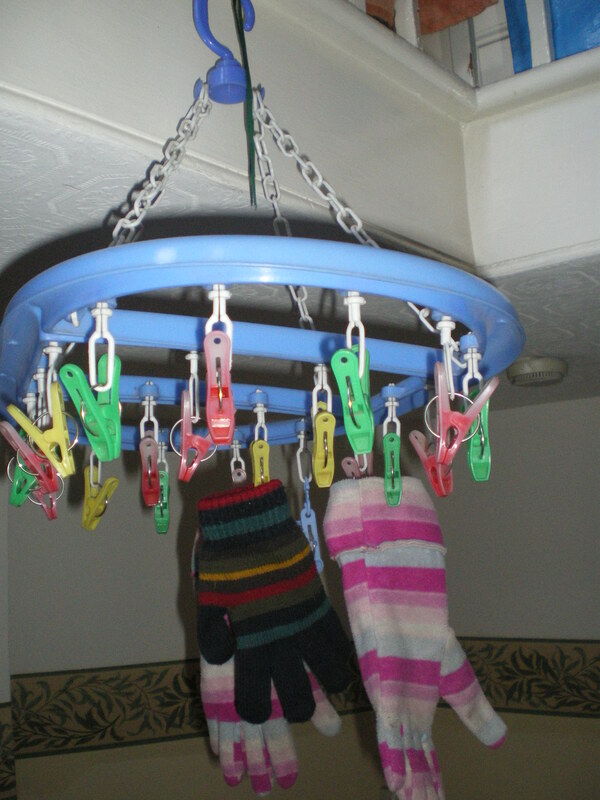 This technique with hangers makes it much easier for shorter and (dare I say it) kack-handed people to hang up wet clothes. Sandra Steingraber even advocates drying the washing indoors at night for health benefits. Damp, warm air is much more comfortable for an asthma sufferer to breathe (like her son Elijah) than centrally-heated dried-out air. As I normally put my washing machine on in the morning and then curse it for making me late (because I like to hang up the washing before leaving home), this new schedule could better suit my own timetable as well as ease my daughter Nell’s asthma symptoms. Do you have any other clever household tips that have revolutionised a really dull task?